Take segment 1, “Wanted: Dead Then Alive”. 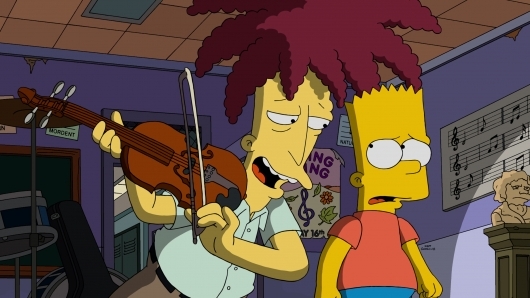 My son wanted to know who Sideshow Bob was and why he wanted to kill Bart (Nancy Cartwright) so badly. He was laughing at the gross out effects in the segment. 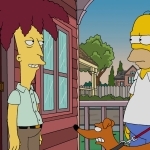 Being that my favorite episode ever is the 22-year old Cape Feare from season 5, in which Sideshow Bob (Kelsey Grammar) chases Bart and the Simpsons into witness protection. 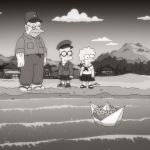 This segment hit all the warm nostalgia notes, with the DIE BART DIE tattoo, a rake, and Bob reading classic poetry. 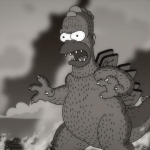 Segment 2, “Homerzilla” is exactly what is sounds like. This segment is half homage and half parody and of course, Homerzilla (Dan Castellaneta) is kept calm by a donuts. The final segment, “Telepaths of Glory” is a version of the film Chronicle and the first person film movement with Milhouse (Pamela Hayden) as the mad one. And yes, we do get a Kang and Kodos sighting near the end, with them joking about the duration of the series. 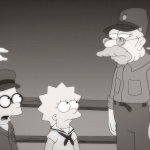 The show ends as it begins with “scary” nicknames of the cast and crew, like James “You Have No Idea How Much You Frighten Me” Brooks, and of course, Bat Groening. 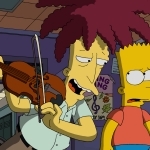 While not the best Treehouse of Terror they’ve ever done, this was a good effort with topical allusions, spoofs of modern movies and tropes, and the moment many have been waiting for – Sideshow Bob. 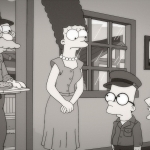 That was my favorite segment, as it was for my son, who immediately asked if we could watch more Simpsons and Treehouse of Terror episodes after. There’s really no better review than that. 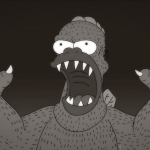 The Simpsons “Treehouse of Terror XXVI” (that’s 26!!!) airs tonight at 8:00 ET on FOX. 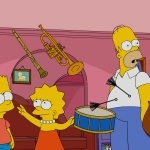 In the annual fright fest Halloween episode, Sideshow Bob finally kills Bart, only to reanimate him; Homer wakes up with short-term memory loss; and Lisa, Bart, and Milhouse get super powers from radiation in the all-new “Treehouse of Horror XXVI” episode of THE SIMPSONS airing Sunday, Oct. 25 (8:00-8:30 PM ET/PT) on FOX.